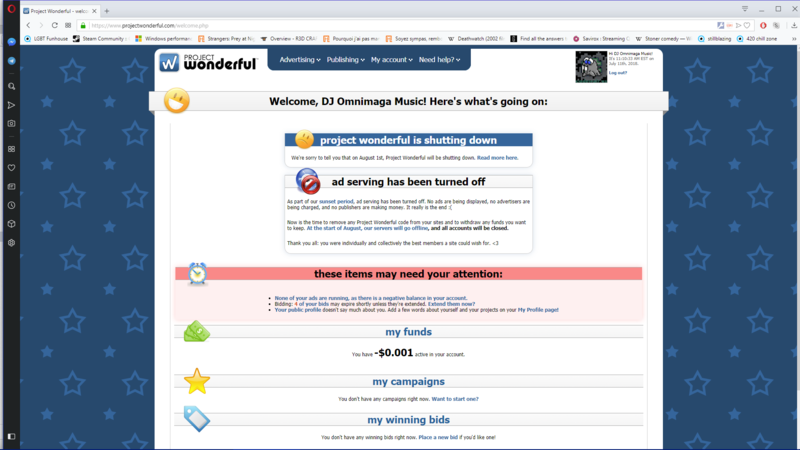 Well, some sad news today: our beloved ad provider Project Wonderful is shutting down on August 1st. They provided us with the ad box above this page (disable AdBlock if you don't see it) for more than a year and a half now, you guys had a good time bidding random stuff on this box and overall, we only have good words for it. But, unfortunately, giants such as Facebook are killing individual blogs and websites in favor of their own platform and it's taking a toll on Project Wonderful. They were founded to serve independent websites such as ours, but they're now in a situation they cannot do that anymore. So what does it mean? Bidding and ad serving will shut down one month from now on July 11th, so if you want to do so, here's your last chance. Otherwise, we have a few other alternative sources of revenue you can choose from: you can either become one of my patrons on Patreon or directly send us money on PayPal. Both will give you a supporter rank on CodeWalrus and its Discord server in appreciation of helping funding our server and development costs.